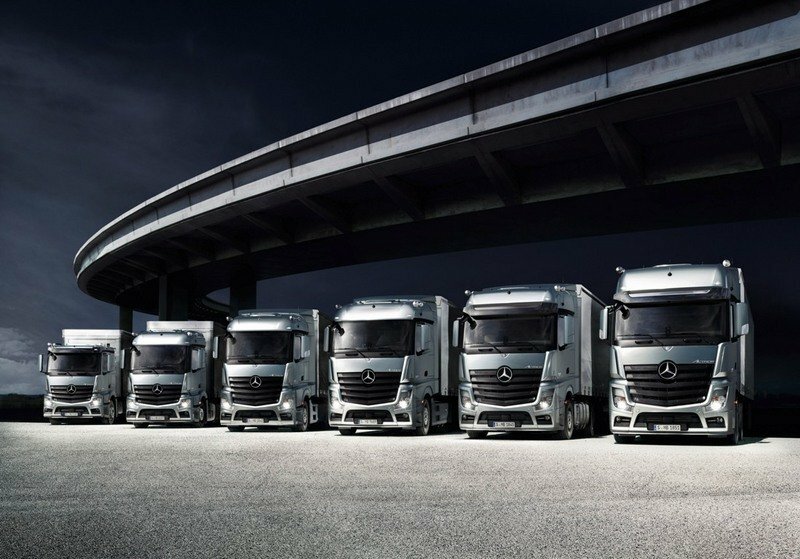 The Mercedes-Benz Actros range had a huge success and it even won the "Truck of the Year" award for 2009 and 2012. The vehicle is highly appreciated for its premium cabin and the strong build quality. The Mercedes Actros and Volvo FH are considered the most reliable trucks in the 44 tones segment and the German company also offers the biggest warranties for its parts. Moreover, when equipped with the Euro 6 engines, The Actros is also the most efficient truck in the segment and can be rivaled only by DAF’s models. 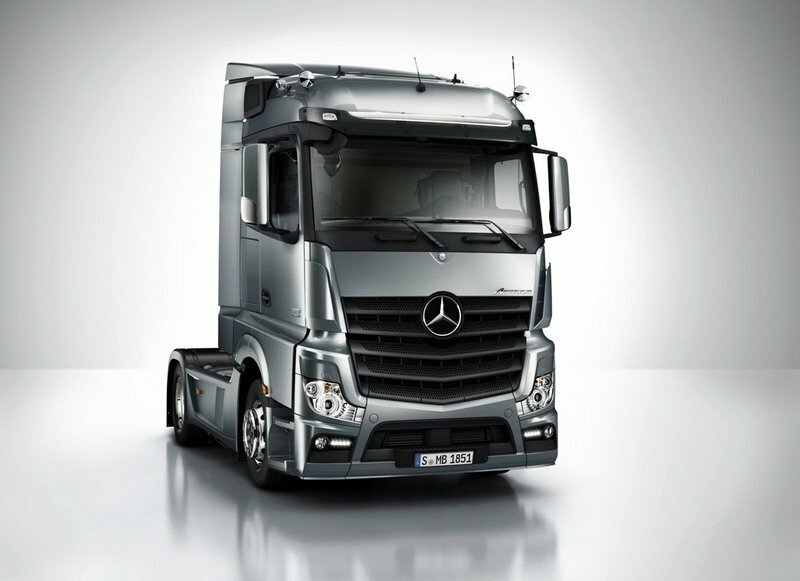 During its history the German truck has been continuously revised and the latest updates were made in 2012. The Mercedes Actros is available in both rigid and tractor configurations with 4x2, 6x2, 6x4 and 8x4 axles. There are also four different cabs available including ClassicSpace, StreamSpace, BigSpace and GigaSpace. The exterior design of the Mercedes Actros it’s almost as good as the one of the Scania R Series. In 2012, the cabin has received a lot of modifications and now features even a better design. The overall stance of the Actros is dynamic and muscular. The imposing grille is traversed by four horizontal stripes while the three pointed star takes center stage and dominates the flat front. The side view is also pretty catchy as there is a beautiful flow between the front section and the flanks. We also like the bumper, door wind deflector and the entrance as they merge seamlessly into one another to form a single unit. Most of the exterior modifications were made to improve the truck’s aerodynamics and the Actros was highly tested in the wind tunnel. Thanks to the aerodynamic design the overall efficiency was also improved significantly over the previous model. Hop inside and you’ll find one of the best kitted truck cabins available on the market. There is also a lot of space inside and thanks to the flat floor the driver can move through the cabin effortlessly. To maximize the ergonomy, the dashboard features a wrap round design and is fitted will all the necessary controls which come easy into hand and have a logical layout. The instrument panel design, materials and layout are the best-looking of any truck available. When equipped with all the “toys” of the superior trim levels, the truck’s ambiance is impressive, with big, clear gauges, an uncluttered center stack and tasteful trims spanning the dashboard. Combine that with the classy optional leather, complete with contrast piping, and you’ll see why the Actros cabin is nothing short of excellent. The functional area of the cockpit is finished in practical anthracite whilst the rear, ceiling and area around the co‑driver’s seat are appointed in a light almond beige colour. Needless to say, that most of the materials are part of the high class. Despite the fact that some of the old cabins were starting to rattle after a few thousand kilometers, the new one looks pretty durable, with solid fittings. The steering wheel design was also changed, and now is more robust. However we find it a bit big for our tastes and we consider the Volvo FH’s steering wheel more practical. On the other hand, the driver’s seat is highly comfortable and thanks to the increased width is the largest unit in its class. There are four versions of the driver’s seat available including rigid seat, suspension seat, comfort suspension seat and the climatised suspension seat with integrated massage function. The beds are also new. Even in the models with a 2.3-metre wide cab, the bed behind the driver’s seat measures 2000 x 750 mm while in the 2.5-metre wide cabs, the dimensions increase to 2200 x 750 mm. The upper bed is available in two dimensions measuring either 2200 x 600 mm or 2200 x 750 mm. Interestingly, if the truck is not parked on a flat surface, the bed can be levelled using a spirit level. There are also enough cup/bottle-holders to accommodate more than double the truck’s seating capacity and they are place ergonomically all around the cabin. 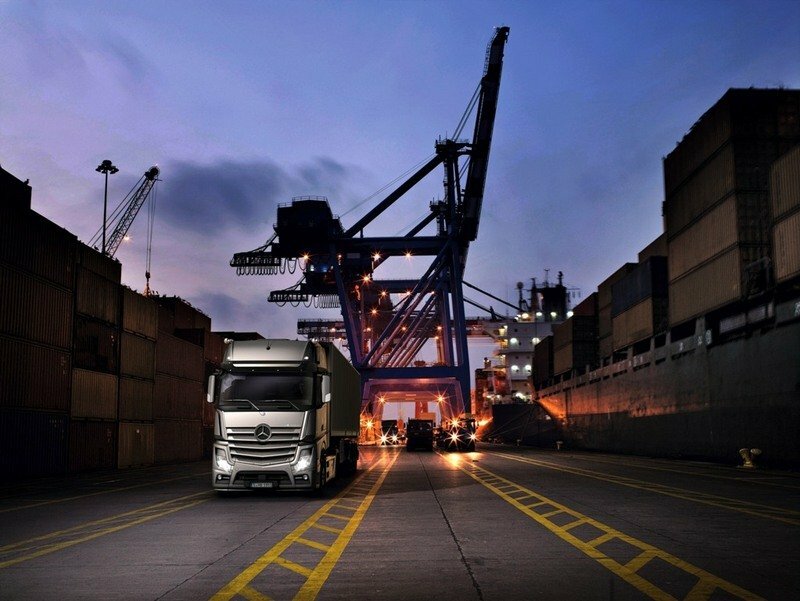 The Actros OM 471 six cylinder range is the most efficient in the 44 tonnes segment. The truck is available with both Euro 5 and Euro 6 engines with an output range between 421 – 510 hp. Furthermore, the OM 471 is the first engine in its class to be homologated in accordance with the future Euro 6 emissions standard. One of the particular highlights of the new OM 471 is the fact that, if the standard rear-axle ratio of 2.611 is specified, 200 Nm of extra torque are provided when the automated transmission is in top gear so as to prevent downshifts when driving uphill. 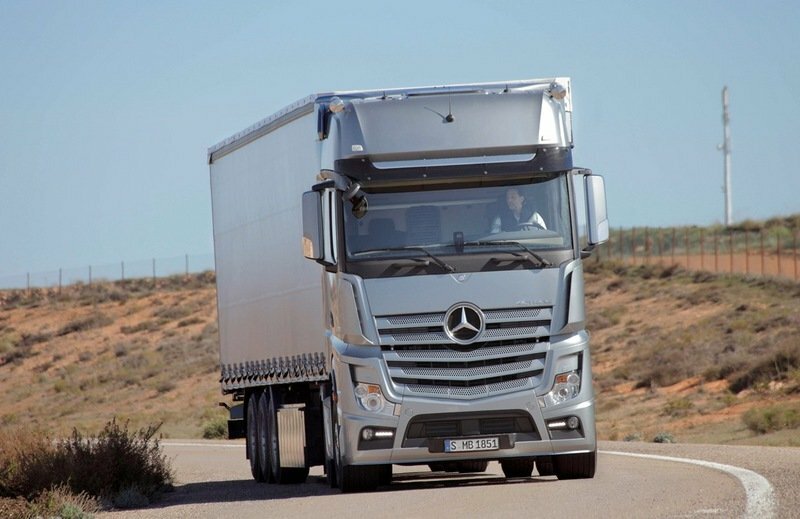 However, even if the Actros is the most efficient truck in the segment it won’t deal too great with the hills and its slower than most of its rivals. The straight line acceleration of the engine it’s also unimpressive and the Scania R series or Volvo FH will leave it fast behind. On the other hand the engines are fairly smooth and have a linear power delivery with plenty of torque available at low rpms. The engine power is sent to the wheel through either a PowerShift G211 or G281 fully-automated 12 speed transmissions. These are upgraded versions of the already successful transmissions of the previous model. The new ones was tweaked to offer a faster and more precise response. On the road, the automated transmissions are a competent ally and require a minimal amount of intervention. The ride’s comfort is assured by four air suspensions which soak most of the road bumps with ease. The spring track of the new Actros is also wider than the previous one and deal better with big loads. The front axles are available with either steel or air suspension and with a choice of tonnages. The number of spring layers varies depending on the permissible axle load. One of the new features include weight-optimised suspension with single-leaf parabolic springs on the front axle. The engine brake is controlled in three stages through the steering column stalk. The retarder is very capable and it will prove to be useful in a wide range of slowing situations. Thanks to this component, service brake applications are minimum and the brake discs are kept cool and fresh, being perfectly prepared for any emergency situations. The truck is also permanently kept in check by a host of high tech electronic nannies which include the adaptive cruise control, Lane Keeping Assist, Stability Control Assist and the revolutionary Active Brake Assist with autonomous emergency braking when stationary obstacles or moving obstacles ahead are detected. The new generation Mercedes Actros moves the German reliability heritage further. The truck’s cabin is more comfortable than ever and the Euro 6 engines are a strong statement for the Actros efficiency. The exterior design is also catchy and the German truck is available in a wide range of configurations. The engines may not be as lively as other units in the segment, but they are able to do their jobs just fain and can carry massive loads with maximum efficiency and without too much drama.